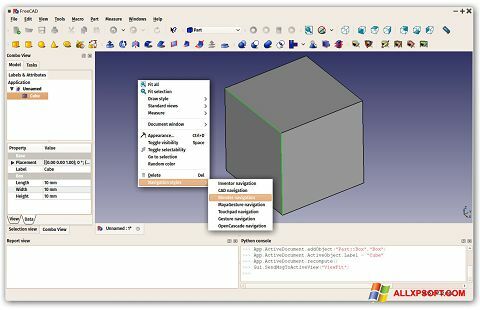 FreeCAD for Windows XP - software solution for the implementation of 3D-projects. Supports the development and implementation of engineering tasks of any level of complexity. Work profiles that are customized by the user for their own needs are supported. The application includes tools for 3D developers. Management of objects is supported, including work with planes, scale and turns. Useful product for drawing operations. Possible work with scripts. Changes can be made using macros. You can free download FreeCAD official latest version for Windows XP in English.